Club Penguin Cheats by Mimo777 Club Penguin Cheats by Mimo777: Club Penguin Secrets of the Bamboo Forest Sneak Peek! Club Penguin Secrets of the Bamboo Forest Sneak Peek! Sweet! I can hardly wait to check out the "secrets" at the Stage! How 'bout you? Have you played Ice Road Penguins? Awesome post that looks so cool! Hello mimo77 the secret of the bamboo forest is amazing so everyone who is reading this comment be on clubpenguin on friday for a new play is coming to the stage! Wow! Great Mimo! I didnt see that! That look like a lion! They might make a chinesse dragon too! Its going to be very cool! I cant wait the new puffle furniture! Can you please come in 10-20 minutes on Iceland at beach? I really want to met you! That does look pretty cool. I wonder what it is for. Ya! The secrets of the bamboo forest looks awesome! I can't wait! Yep, but please do not put (CPG MOD) when you aren't answering a question. Thanks! True, but something the "ewwest" thing are the best! Yep! Can't wait! Please only put (CPG MOD) when you are modding! Thanks! yeah can't wait till friday!! I am looking forward to this new play and I think it could be really something big I've been waiting for a new play for ages I wonder if it will be better than the fairy fables or the golden puffle.Who knows only time can tell. I agree because it does look really cool! Only put CPG Mod when you are Modding, ok? Only put CPG Mod when you are Modding! awsome i been looking for a swimmming place for ages u see i havnt gone swimming because we dont have a pool her in australia so this could be sik!!!!! First, only put (CPG Mod) when you are Modding. Second, he can't because it wouldn't be fair, and you have to be a Mimo Mod or higher to meet him!...Or the winner of a contest if that is the prize! AND only put CPG Mod when you are Modding. hi mimo i a realy big fan of u can i have your autograpgh someday lol! anyway this play loos aamazing cant wait because there hasnt been that much new plays lately! This looks awseome! Is there going to be cheats in the "Costume Trunk"? I just wanted to say thank you 4 everyone who gave me encouragement to keep tryin and be a mod...and now i will not give up...thank you sooooooo much! wooooooooooot!! sweet looks like a...hmm maybe a wolf dressed up? that does not look like a hint for a baboo forest! Yep, Club Penguin said that the new catalog is coming this Friday, so be on the lookout for that! It will be exciting! Hiya! !, Just something to point out to you Xpinkygirlx1 Dont put (Cpg mod) Next or under or wherever beside your name etc. when your not congratulating someone or answering a Question. Hey Mimo how do you become a mod i really want to be one. PS. I won your Halloween contest for 2009 it was ten questions and i think im the tenth one down. Whenever there is a blank screen in the HQ, it means that Club Penguin is about to release a new room. And you are probably correct in assuming that it is something to do with the cave. Hope this helps! The new play is gonna ROCK!!! i bet that picture is a chinese dragony-tiger thing! Please don't use CPG Mod when you aren't modding. And if you want to meet him come to a party of his or once you become a Mimo Mod or higher you can become his buddy! You can become a Mod by answering people's questions like I am now, then put (CPG Mod) next to your name. (Only when you are Modding! Important!) Good luck! sadly, mimo cant meet you because its not fair to others who want to do the same thing. But keep working at being a cpg mod and when you are a mimo mod, mimo will add you then! oh yeah, and you dont have to wait four years for mimos next party, its more like next month maybe,lol! Oh yea, and Hnwjanuary11, I have a question I followed all the rules how to become a CPG Mod, but Im not on any on the lists! :-O Please reply! Thx! Sorry, but Mimo cant meet people on Club Penguin. Hes really busy not to mention that it would be unfair. If you get to be a mimo mod or higher, he will add you! I cant write all the things down right now for u cuz i have little time. If you scroll down on the Home page of CPG, on the left hand side Mimo has the rules for being a CPG Mod. Read them and youll know! As all of us should know that mimo is a very busy penguin. He is working on alot of cool stuff right now. So go to Mimo Games and check that out. OR you can follow him on twitter to see what he is doing. Awwwww, thats soooo sad. ): My friend has had 2 dogs put down so i know how u feel. Just dont mention it to the person. But say that youll help them through it. Hope its ok soon. Your power's out?! Not cool yo!...Lol but I hope you can get back on soon! I knnow that you followed all the rules, but you have to do it as often as you can in order to get on the Mod list. I remember when I started Modding I barely did to any questions and stuff and I didn't make it. So I did it more and I became a Super Mod! Just keep trying and I hope I helped! I'm so ex sided for the new play! OME i just got back from Disneyland and got on your site and I'm so ex sided for the puffle party again this year i hope its better then last years! oh i now know one of my fave songs its called i love rock n roll anyway way off subject bye!!!!!!! I agree! We should! Party for the new stage! The good thng is that we don't have school on Friday... and monday! Woot! Also, only put "CPG Mod" when your modding! Yah! We need new things, especially old penguins! Wolfs in Club Penguin? That'll be cool! I can't wait for the puffle stuff, either! i think they are doing this play based on the Chinese New Year because if you look at wat the... dog lets say is wearing. Chinese New year is on Saturday/Sunday according to my chinese teacher. It looks REALLY good. looking forward to it. Mimo will only meet mimo mods, mega mimo mods, and top mods. First of all, don't put (CPG Mod) when you're not modding. Second, all you do is answer questions THEN put (CPG Mod) next to your name. Well you're a new modder right? I had to mod for like half a year before I became an official mod. I noticed that too! hmmm what could it be? Oh, january, I'm so sorry for your friend! Yes, you should make her a nice card. ;-) They might have a wolf... Maybe! 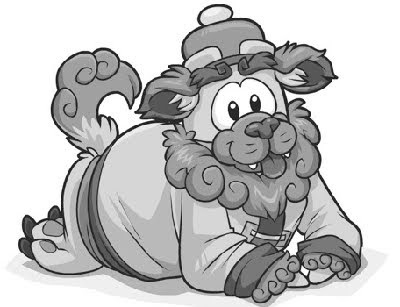 And yes, i agree, i'm SOOO excited for that puffle stuff coming up! Remember to keep preparing =D I'm saving up my money in case there's anything good to buy. I've got around 200,000 so far, cuz i spent a lot of money on the new catalog. I DID have like 220,000. Probably.... there usually are! And however strange and "secret"-oriented this upcoming play will be, it looks like there'll be a cool Costume Trunk... and frankly but truthfully, that's really all that matters to me! Well... that's a hard question! I let a couple of my puffles run away because it was costing me a lot, but... my faves are probably purple, black and white puffles. Room 1 is a forest of bamboo hiding Room 2, a temple that has the golden feather and the monkey king. Also.... There will be warriors. I am totally sure...you can find them on your own or just enter the mimos blog!Mimo Will SURE 100% find them all! I totally understand!Thank you for telling me! I will put CPG MOD oml when i wil mod!I wil MOD how much i can! I know! Thank you for remindering me to put the CPG MOD thing only when i mod!Sorry! When are the haiku winners going to be announced?? sorry he really can't but if you become a good mod he will meet you@!!! First of all, congratulations for winning the contest! Second, only put (CPG MOD) next to your name when you're ONLY answering a question. Just keep answering a lot of questions correctly, and eventually you will become a mod. How is that ew? It is a cute puppy (well i think it is a puppy). lol! well waddle on! Mimo, sorry I haven't been modding! Very busy! Mimo, I'm going out of Town for 1 week. I am leaving on Friday, I will let you know when I come back home. My dad is bringing his Lap Top, so I can mod a little. WOW!!!!! that is some great attitude! How he came! Congrats bumper! im too on the soon 2 be mod list. i hope we both will become mods. happy modding! I guess we just have to wait. But Im pretty sure something is gonna be hidden. Check back for more! Mimo will post! i have a feeling that this is going to turn out to become a new mission, maybe member only :(. Also, everyone be ready for the new play in the stage on Fri.! Remember to only put CPG Mod when you are Modding! A lot of people forget that so please remember next time! ...True. But with the Stage it hasn't been so good! Some of the recent plays don't even have a cheat in it! Yeah, it could be based on that! And only put CPG Mod when you are Modding. THATS IS JUST SO RANDOM!!! ANYWAY IF I WAS BILLYBOB I WOULD DO A SCULPTURE OF MIMO777 AND ME! Thanks for the vote, but you can only vote for one. So narrow it down to one of your options and then let me know! K? Lucky! I've always wanted to go to Disneyland! Dear Lolo. Becoming a mod is very easy. And I know that you have been following the rules. Me? Im not a mod yet. But Im trying. So just answer questions and leave everything else to father time! A sculpture of you and Mimo? That would be pretty interesting! aaaaaahhhhh! that thing looks freaky! but it also looks cool. I'm not sure which one it is! Nice idea and i can't wait for the puffle stuff too! Yeah but he answered a post! Therefore he is alowed to put CPG MOD because he was acting as one! P.S. I have a new signature! Yep! it could be big or it could be rubbish but only time will tell like you say! Aaaahhh! Don't hurt meeee ;)! But i pick the black puffle. When is the contest winners? going to be anonnced? You know having two mods answer means you have a good question! and Silveratomis right and i agree with him! just keep trying and you will get there in the end! Yep! everyone be ready! you don't know what will turn up. but i don't think if there is gonna be a mission it would be a member one. It's very easy to meet Mimo! Just come to his parties! It's very cool! But that would be cool though having a sculpture of mimo and you! You can't get his autograph, but you can meet him on Club Penguin! Just check this blog everyday, and his twitter account too, and come to his parties. Very easy! I wouldn't hurt anyone! (I'm not very strong...lol) But thanks for voting! I am having a party for becoming a MOD, and for getting 100 subs on my youtube account. Awesome! Congratz! I hope that I can make it, and I hope lots of penguins come! Wait...what room? Ur iggy or...? oh no! i missed your party silveratom! i could come but i saw ur comment too late :( congratulations on becoming a mod! Happy modding. The statue looks really cute and cool!!! Sounds great!!! But I have plans that day and I dunno what time it will be over in the UK. I'm sorry. And also what room? Cause I might be able to come.....Might. Look I know this sounds weird and stuff but you don't have to put CPG Legendary Mod. I know it's really cool and stuff but you only have to put CPG MOD, it's quicker anyway. Silvertom I'm sorry I missed your party! Tell us all about in a comment! Again so sorry. AGHHHHHHH DON'T HURT ME HNW!! I'M YOUR FRIEND...Or am I?? I have a bad memory! Anyway where was I??? Oh yeh! AGHHHHHHHHHHH i like chocolate and the purple puffle! Ok AGHHHH *Runs off screaming head off while Hnw chases into the sunset* lol!! P.S. Sorry for the caps! Just a joke! I'm not going to hurt you! I'm only chasing you because you have a chocolate bar! GIMME DA CHOCOLATE! Lol, but thnx for voting! Waddling on and on! Hnwjanuary11 (CPG Mod)...I guess ur right. Sorry! I agree with cool, but cute? Lol, so not cute ;)! cool! p.s. when will you post winners for the haiku contest?????? Mimo this may not be here by the time you read this comment, but all the servers including the most popular in my opinion, Abominable, either have one or two bars! Isn't that weird? Oh, and another thing, here is a reason why CP doesn't make sense. At the Snow Forts you can see the Ice Rink. It has two sets of bleachers. But if you go in, it only has one! (Didn't it have two before??) Isn't that weird? Also, the servers I mentioned are getting back to normal...some at least. I think it is...Well a little! I noticed! Also, we already know what's in the cave, don't we? Isn't that why we got let in for 1 week? Yeah i know! i never thought it mattered though. You don't have to have a Twitter to know what Mimo's up to! I don't have one! Mimo has some mini-box on the left side of the page, and it tells you all of his Twitter updates. Sounds fun! I will try to come if I can. Hope to be there! Just to let all of you know, I will be on for a while tomorrow because school has been cancelled where I live! I'm supposed to be getting about a foot of snow. Comment to you later. This sounds whacky but what if that thing in the picture was like a sensei of a different martial art like card-fu!!! Maybe he and sensei are old friends!!! Now that would be cool!!! It would also be another way for Disney to make money! Yeah, I know! I only put 5 on! How silly of me! So I updated it in the latest CP is Improving post. Check it out! I updated it on the newest post. Check it out, and I will put down a vote for pink! Lol! I forgot the date it was! I thought it was something way ahead! Anyway I can't make it, I have very important plans I can't change with my family! No!!!! My chocolate lol!! *Hnw grabs chocolate bar, Kkkkkk123 grabs back and legs it into wrestling arena, Hnw chases into ring, .....See where this is going? FIGHT!! LOL!!! * Who are you backing? Hnw or Kkk, no hard feelings on who you vote for seriously don't worry! Is that a... lion in a coat or something??? This is so cool. Found the golden feather yet?